Turkey farming without beak trimming. Is it at all possible? Turkeys are especially liable to behavioural disorders such as feather pecking and cannibalism. The exact reasons for this have not yet been sufficiently clarified. A model and demonstration project funded by the Federal Ministry of Food and Agriculture (BMEL) was intended to do so. However, the outcome was rather disappointing. Participants in the study have reported that they had to treat turkeys with open pecking wounds almost daily. What triggers feather pecking and cannibalism could not be clearly determined at any of the involved demonstration farms. There is no doubt that the phenomenon of feather pecking and cannibalism is a complex issue. Short-term improvements were achieved by providing ‘manipulable materials’ to keep the birds occupied, for instance; however, they were not always successful in the study. Another important factor is light: in acute cases, temporarily reducing light levels was the best method to reduce feather pecking; unfortunately, this is not very compatible with natural lighting in the barn. Finally, genetics also play a role: breeding companies have already incorporated the feather pecking/cannibalism trait into their breeding index. However, it takes time to see the results in practice. 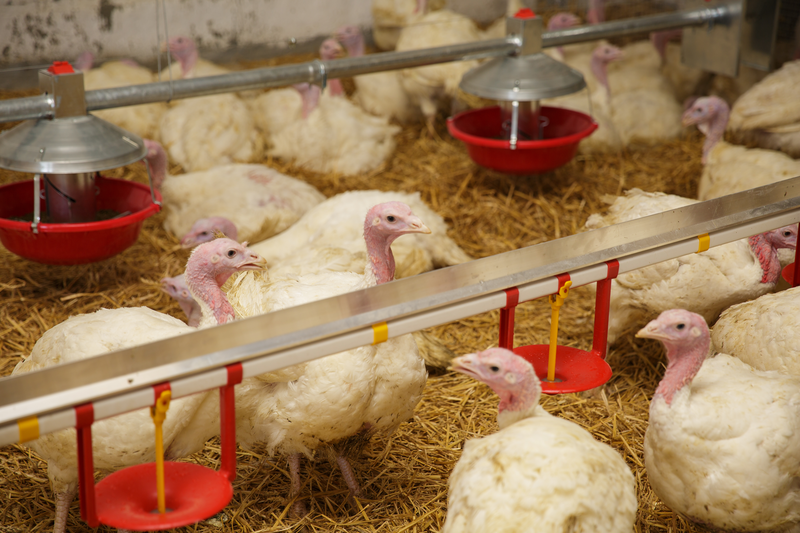 According to the Animal Welfare model and demonstration project findings, it is presently not possible to eliminate routine beak trimming in turkeys, although this remains the long-term goal. Thus, a solution must be found. And this is where Dr. Eckel’s Animal Welfare Initiative comes into play. Dr. Eckel is one of the first companies to produce feed additives that have been specifically developed to improve animal welfare sustainably. MagPhyt was specially developed to counteract stress-related behavioural disorders. It is the first time that a feed additive combines the anti-stress mineral magnesium with the soothing effect of hops. MagPhyt is already used to counteract cannibalism in pig farming and piglet rearing, and there is evidence of its effectiveness both in studies and in practice. This makes MagPhyt also very suitable as an anti-stress feed additive for poultry farming with its own set of special requirements. MagPhyt is Dr. Eckel’s contribution towards reducing feather pecking and cannibalism, and finding a solution that eliminates beak trimming in turkey farming. Background: On 9 July 2015, the Federal Ministry of Food and Agriculture (BMEL) and the German poultry industry agreed to phase out routine beak trimming for laying hens and fattening turkeys. This agreement demonstrated that the poultry industry is willing to find a new solution and will not trim the beaks of laying hens as from 1 August 2016. Due to a lack of scientific knowledge and differences in the animal species, this was applied to turkeys too: as from 1 January 2019 beak trimming is to be eliminated. In order to include the animal welfare aspects of feather pecking and cannibalism, the German poultry industry and the BMEL have agreed that beak trimming in turkeys can only be eliminated when adequate findings and options to avoid feather pecking and cannibalism exist. Feather pecking and cannibalism are not only important indicators of animal welfare, they are also a cause for extensive economic damage. Increased feather pecking results in increased mortality and emergency slaughter. Signatories to this animal welfare measure were the German Poultry Association, the Bundesverband Deutsches Ei e. V. (German Egg Association) and the Verband Deutscher Putenerzeuger e. V. (Association of German Turkey Producers). The Lower Saxony Animal Welfare Plan also stipulates that beak trimming for fattening turkeys should be eliminated by 31 December 2018. A number of studies have been conducted since the agreement was reached, some of which were part of the Animal Welfare model and demonstration project and investigated the incidence of feather pecking and cannibalism in fattening turkeys.